The hands on communities of like-minded people who learn from one another, socialize together, and help eachother achieve goals are hotbeds of productivity and collaboration. The new fresh and nutritious meals served from DIRTT’s Greens Cafeteria are a key part of the company’s green commitment. In-house restaurants not only reduce DIRTT’s carbon footprint because employees don’t have to drive elsewhere for lunch, but they also gives staff healthier food options and increases DIRTT’s productivity. Your client buys into your concept and design for a new, innovative work space that will leverage creativity and attract young talent. Yet, statistically, approximately 90 percent of corporate change initiatives fail to achieve their projected goals (as measured by financial performance the following two years). What are we to do with this paradox? 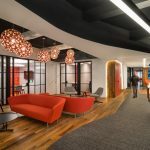 EwingCole used BIM in new ways to improve the efficiency and effectiveness of their communications through the design process with United Therapeutics. So we asked Howard Skoke to tell us about the tools they use and the impacts they’re having for EwingCole and its clients. Solid-state lighting improves physical well-being. But what role can architects and designers play in this digital technology, particularly when partnering with manufacturers to create a new modality of light?